THE Swanage Railway’s showpiece event for this 50th anniversary year was its Strictly Bulleid event in the spring, but it could not let the actual July 9 anniversary slip by unobserved. 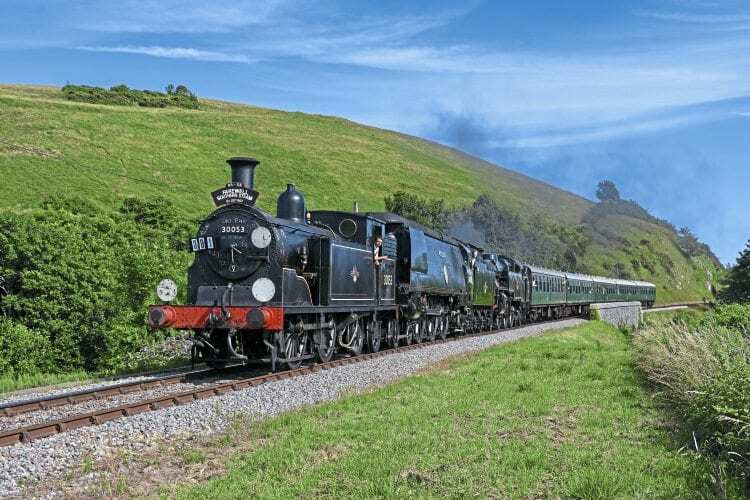 The result was the Southern Sunrise mini-gala on that anniversary Sunday, which like the Bluebell event featured three locomotives in steam, but all drawn from the home fleet. A total of 12 departures were steam worked from Swanage during the day, hauled by ‘Battle of Britain’ No. 34070 Manston, ex-LSWR ‘M7’ 0-4-4T No. 30053 or BR ‘4MT’ 2-6-4T No. 80104, the latter running in the guise of No. 80146, which was the last steam locomotive to work over the line before it closed. Steam services were strengthened by the timetabled Swanage to Wareham diesel services, top-and-tailed by West Coast Railways Class 33 No. 33025 and the railway’s own ‘Crompton’ No. D6515. While not technically part of the gala, the presence of the two Class 33s added to the 1960s Southern feel. At 13.45 a commemorative cake was cut at Swanage station, the day being rounded off with a triple-headed working from Swanage to Norden. The ‘M7’ was suitably adorned with a headboard and chalked-on messages, and led the procession with Manston sandwiched between it and the ‘4MT’. The working had no historical precedent, but it was a fitting way to bring the curtain down on an important day in the annals of railway history.